If mobility and disability challenges are preventing you from enjoying the outdoors, there are practical and affordable solutions that can allow you to safely access your garden or deck. 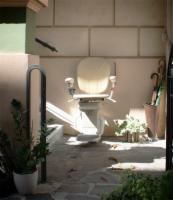 An outdoor stair lift is perfect for traversing uneven pavement, slippery surfaces, and porch stairs. These devices offer all the same great features as other stair lifts with the additional benefit of being able to withstand the elements. All key electrical and mechanical components have been waterproofed and protected so that you can operate your lift in any type of weather. AmeriGlide’s outdoor stair lifts also come with rugged and durable covers that add an extra layer of protection and will keep your stair lift clean, dry, and ready to use. Visit our Marietta, Georgia location today to order your custom fit, outdoor stair lift.